A book of maps. One hundred and twenty-seven of them, held together by three brass screw-on bolts. On the hard cover – the dust jacket, if there ever was one, is lost – the words Atlante della Cassa del Mezzogiorno, 1950-1962. The book has no introduction, and no text outside of a table of contents, the customary brief publisher’s information and the title, place names and legend of each of the maps. So scant is the context that we could choose to misconstrue the word Mezzogiorno in the title and to translate literally, nonsensically, perhaps a little poetically: ‘Atlas of the Midday Fund’. 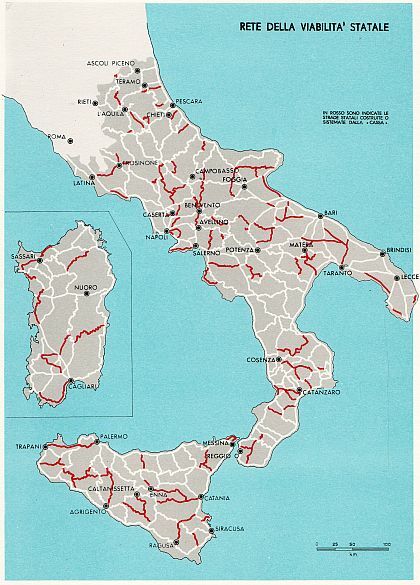 And we could look past the fact that these happen to be maps of Southern Italy, seeing that they are also, and more visibly, fragments of a geopolitical body laid on a table and dissected. This could be any country. 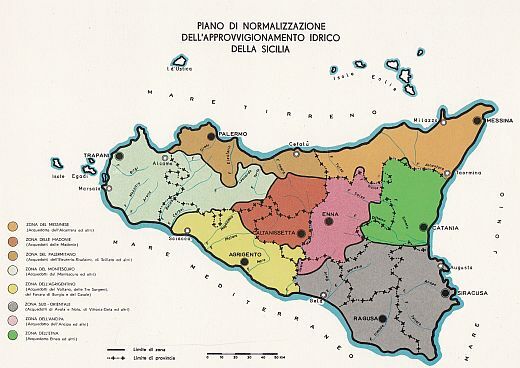 Above, it is a map of Calabria with the territory known as the Sila and a small area north of Locri coloured in, blotchy, as if to illustrate the spread of a disease. Below, the more familiar boot shape complete with major islands is criss-crossed by red lines that resemble varicose veins. 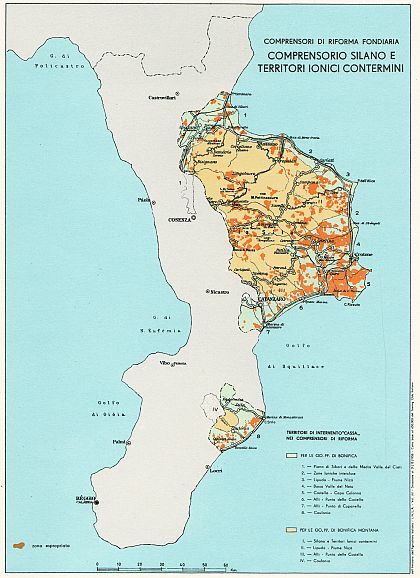 But what these maps document are interventions – in this case, land reclamations and the building of new roads. In other words, they are about the cure, not the disease. This could be any country in which such interventions had been prescribed and carried out, for these maps are as much an attempt to represent the territory as a way of thinking about and acting upon the territory. With this key in mind, each map becomes at once text and context. Its explanation, its justification, its frame of reference is to be found in the image itself, taken as a whole and over time: we built these roads because there were none; we drained these marshes so that the land could be farmed, and so forth. The old territory, which is never shown, was the problem. The new territory – the object of representation – is the self-evident, necessary solution. But we must restore some of that missing context. The Cassa del Mezzogiorno – which properly translates as ‘Fund for the South’ – was an organisation established by the Italian government in 1950 to administer loans granted by the International Bank for Reconstruction and Development and the European Recovery Program (better known as the Marshall Plan) for the purposes of a series of ‘extraordinary interventions’ in the economically depressed areas in the southern and (partly) the central regions of the country. The Fund, at least in its initial twelve years of operation that are documented by the atlas, operated with a relatively low level of political oversight and was rigorous in its application of Keynesian theories of economic development to these depressed areas. It was in other words a quintessentially technocratic body, a quality of which the book is a direct expression. Not only the minute representational precision of the maps, but also their aesthetic aspect, the fact that this is a beautiful book to look at, are functional to the fund’s design, which was to remake the landscape: to make it better, more productive, more liveable. I’m not entirely sure what specific information is conveyed the hydrogeological chart of the river Neto and its surroundings, above, but the lines and the colours are very pleasing to the eye. It looks like a place where one could settle. 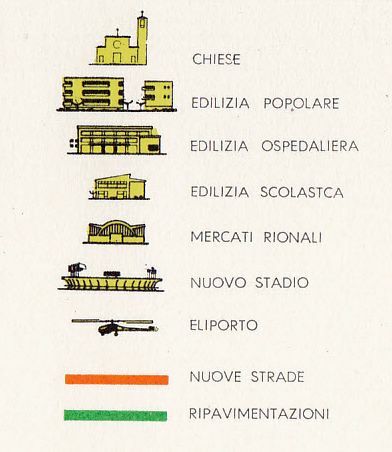 And doesn’t Sicily here look neat, efficient, modern? If like me you’re into legends, this book is full of treasures. 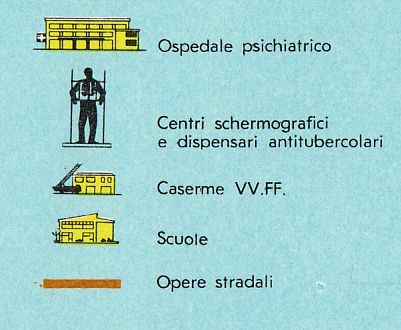 From a map of new facilities built in the province of Naples, I give you, second from the top, ‘X-ray laboratories and tuberculosis dispensaries’. That is the level of detail that the project required and deployed. Psychiatric hospitals get their own symbol. So too do fruit and vegetable markets and heliports. Finally the atlas zooms in onto a sample of individual housing developments, which naturally all look like model projects. How could they not? This is the Ex Campo Ascarelli, on the outskirts of Naples. 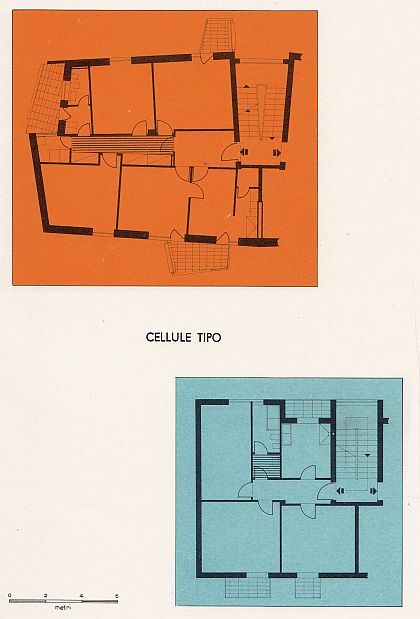 While for the detail of the actual apartments, we move to Secondigliano. when modernization is only outward and fails to invest the economic foundations, the social structures, the modes of participation in the life of the community, it lends itself to forms of bullying and enslavement, of loss of demarcation between the public and the private sphere, of exchanges of protection and personal allegiances whose roots belong instead to an archaic and feudal past. 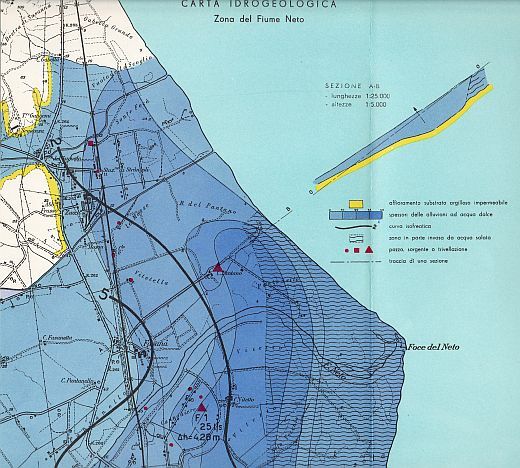 The great modernization project failed, but it is not an outcome that could be read in the atlas: not even by its authors, like Pasquale Saraceno, nor by its critics on the Left, who would have looked at each one of those interventions and recognised its specific material value even as they warned that the politics of the extraordinary intervention would become the means for the indefinite extension of the status quo. For our South has never ceased to be in crisis and in the process of being modernized, there just hasn’t been another utopian moment comparable to the one that the atlas represents. 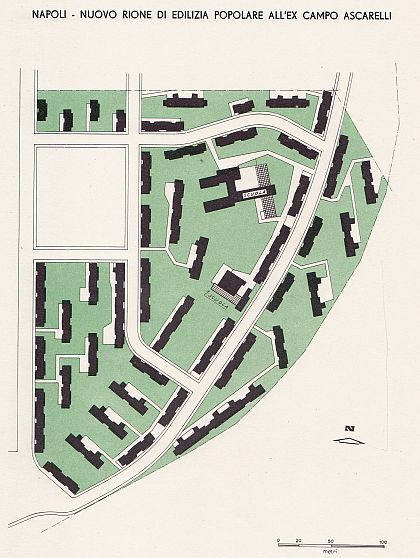 Yet it remains such an appealing text, and such a persuasive model: to think that by improving the landscape, by better designing our urban environments we could create the basis for social progress. And if you came across this book, as I did, on the opposite side of the world, and you pretended that this could be any place, you might just believe the story. I’ll read The Leopard differently after this; certainly not with an architect’s, designer’s or economist’s eye. Or should I? That’s a great point, I had never connected that the novel was written during the decade of the Cassa. Giovanni, l’ho credito, e perch`e no? Ma voglio dire…con la lotta vittoriosa forse sara buono?